If you're obsessed with functionality dressing when it comes to fashion, you'll love this chic pairing of a tan crew-neck sweater and a black and white leather clutch. Rocking a pair of navy suede pumps is an easy way to add some flair to your look. If you're a fan of comfort dressing when it comes to your personal style, you'll love this chic pairing of a yellow blazer and a Gucci bee stripe leather pouch. Sporting a pair of white and black leather heeled sandals is an easy way to add some flair to your ensemble. If you're obsessed with comfort dressing when it comes to your personal style, you'll love this totally stylish pairing of a black cropped top and a Gucci bee stripe leather pouch. You could perhaps get a little creative when it comes to footwear and spruce up your getup with black leather heeled sandals. If you're a fan of relaxed dressing when it comes to your personal style, you'll love this super cute pairing of a white cowl-neck sweater and a black and white leather clutch. Elevate your getup with red suede pumps. Opt for a beige shawl cardigan and a Gucci bee stripe leather pouch to be both killer and relaxed. Bump up the cool of your getup by completing it with black suede wedge ankle boots. If you're a fan of relaxed dressing when it comes to your personal style, you'll love this totally chic combination of a black leather bomber jacket and a Gucci bee stripe leather pouch from Nordstrom. Up the cool of your outfit by completing it with white leather pumps. If you're all about relaxed dressing when it comes to your personal style, you'll love this absolutely chic pairing of a white and black cable sweater and a Gucci bee stripe leather pouch. Add a glam twist to your getup with black leather ankle boots. Wear a mint coat and a Gucci bee stripe leather pouch from Nordstrom for a lazy day look. Up the ante of your look with gold leather heeled sandals. 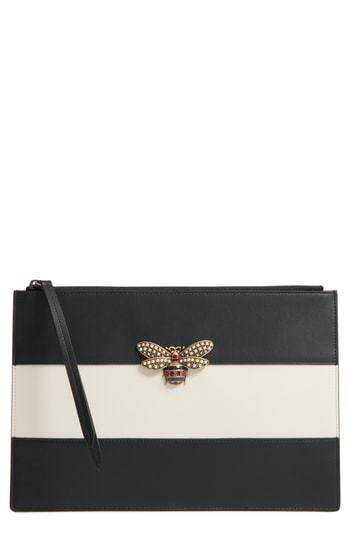 Pair a white coat with a black and white leather clutch, if you want to dress for comfort without looking like a hobo. Amp up the cool of your outfit by completing it with black leather heeled sandals.